After spending years in the long comedy shadow of regular collaborator and scene-stealer Ricky Gervais, Stephen Merchant steps into the awkward spotlight of HBO's new comedy "Hello Ladies," taking on his first starring role and fulfilling high expectations set by fans of Merchant creations like "The Office" and "Extras." After a year that saw relative disappointments when compared to past efforts from comedy luminaries like Christopher Guest ("Family Tree") and Gervais ("Derek"), "Hello Ladies" is the exception in that it not only seems likely to satisfy critical fans of its star/director but could create legions of new ones. Paired with the return of HBO's cult hit "Eastbound & Down," this is one of the most consistently funny new comedies of the season over its first two episodes. While there's reason to be concerned that Merchant's schtick could get tiresome over the long run, he's off to a great start. Having honed his ability to write and direct leads with questionable social grace, Merchant now stars as the latest protagonist in this comedy lineage, Stuart Pritchard, a kindhearted British transplant to the City of Angels, looking for love or at least a good time. He has two friends with whom he heads out to the most vicious club scene in the country, and neither gentleman really serves as the best wing man for poor Stuart. Wade (Nate Torrence) is recently separated from his wife and none too confident to meet anyone new. 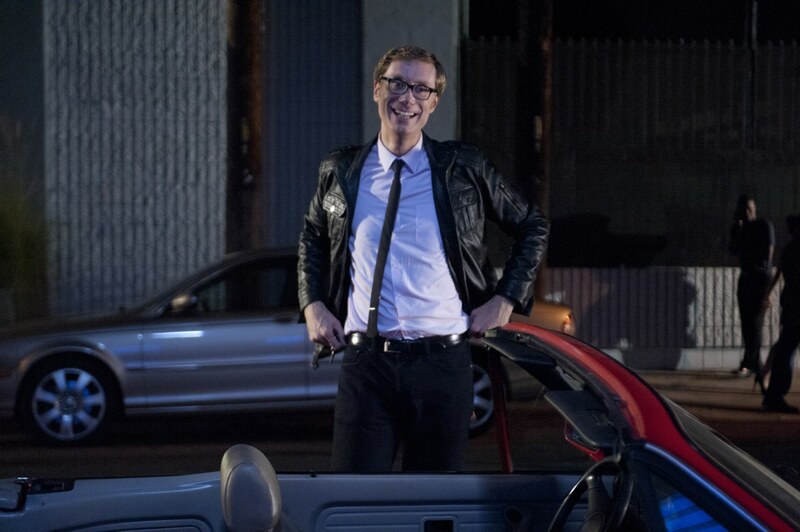 Kives (Kevin Wiseman) is the opposite, over-confident to the point of abrasiveness as he asks strangers if they're "dating, mating, or masturbating" but gets away with it because he garners interest and attention by being an outgoing guy in a wheelchair. He's the guy who gets the pretty girl to sit on his lap because he's different when he's really even slimier than most potential beaus. These are the people that Vinnie Chase and the "Entourage" gang would saunter past in line on their way to the club without even a sideways glance. Stuart and Wade are the true leads, the kind of socially maladjusted gentlemen who awkwardly bring up abortion and recently failed relationships in their first encounters with pretty women at bars in the opening scene of the series. A potential mate says to Stuart that she's from Seattle and he mentions how much he likes "Sleepless in Seattle" before claiming, in the worst bit of small talk ever, that it's the suicide capital of America. 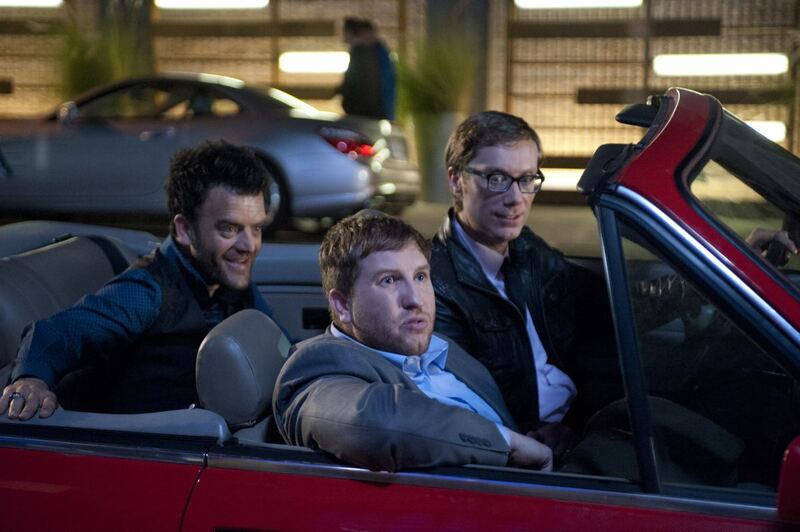 With echoes of "Entourage" and "Swingers," "Hello Ladies" enters a long line of films and TV shows about people trying to connect in a city built around being on the right guest list and pulling up to the club in the hot car, but Merchant and his talented supporting cast keep it funny, smart, and consistently engaging even when it's cringe-inducing in its character's awkwardness. While both episodes sent for review (the series will run eight weeks) do eventually get around to the three male leads hitting the town, they feel anchored by a great performance from Christine Woods as Jessica, a tenant living in a home owned by Stuart who not only offers a bit of female perspective to the action but serves as a great comedy partner for Merchant. Jessica is playing the dating/social game as much as Stuart, but the rules for women are different in a city where every other person is a wannabe actress. When Jessica calls her slimy boyfriend over for a late night visit and changes her mind to the point that she has to hide out in Stuart's kitchen or awkwardly tries to get her girlfriends to listen to jazz and watch "Battleship Potemkin" instead of the mindless gossip that usually constitutes a Saturday night with the gals, Jessica is navigating a social world of gender-based societal expectations just as complicated as Stuart's. The adventures of gawky guys behaving badly on "Hello Ladies" are very funny but it's Jessica's character, and the excellent comic timing of Woods, that elevates the piece overall. In fact, the way Merchant uses the different chemistry he has with Torrence, Woods, and his latest target of gawky seduction is the key to the overall success of "Hello Ladies." Merchant proves he can step into the shoes of the lead role in a comedy with ease but he's still an actor who works best when he's riffing off others. His nerdy, self-aware style isn't a one-man show; it's response-based humor, often either looking for acceptance from someone or gently ribbing those he encounters who are trying to do the same. Of course, most of the comedy of "Hello Ladies" comes back to that uncomfortable, awkward feeling that Merchant loves to give viewers as Stuart tries so hard that it embarrasses the viewer. He regularly takes scenes, like one in which he practically pays for the drinking tab of an entire bar just to impress a woman with whom he clearly has no chance, past the logical breaking point, but he rarely goes for the easy joke. This is not gross-out humor or easy jabs at pop culture. Merchant is too smart a writer and performer for that even if some of the sad-sack subplots for Wade, who pines for the wife who clearly wants to leave him, feel too sitcom-ish. The vulgar Kives feels like a creation we've seen too many times before and one that could grow tiresome quickly but even as Stuart and Wade are progressing well past reason in their desperation, the performers and strong writing keep the show hilarious. And that's the most important thing to remember about "Hello Ladies"—it's very, very funny. Is Merchant making subtle social commentary on the dating scene in Los Angeles? Maybe, but that's not his primary goal. "Hello Ladies" is one of those shows that's deceptively much smarter than people might give it credit for being, but I'm sure Merchant would want people to find it funny above all else. He's a comedian willing to embarrass himself in startling ways—thank God the show is only half an hour, because the awkwardness might be unbearable at twice the length—and his fearlessness in pointing out his flaws in stature and social grace makes for great comedy.